Hey, when you think of Groundhog Day, what comes to mind? Bill Murray? Or this little guy? 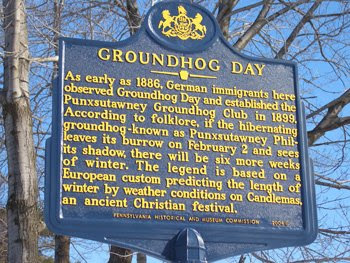 But a Canadian study (leave it to those Canucks) conducted over 30 to 40 years showed that for nearly two-thirds of those years the groundhogs' forecasts turned out to be wrong. That's right, either they were contrary to what they should have been, or winter dragged on its normal duration. 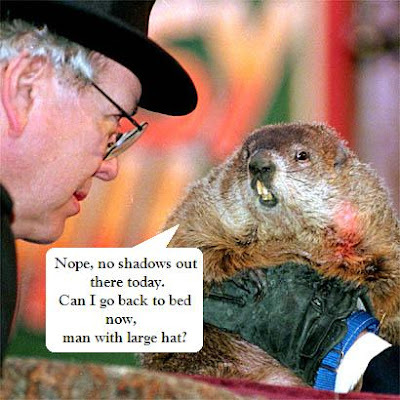 Groundhogs across the nation had a dismal record of being right about 37% of the time. For shame. No wonder they've been the subject of ridicule. And look at the names they've been given. Ohio's Buckeye Chuck. Georgia's General Beauregard Lee. Alabama's Smith Lake Jake. New York's Staten Island Chuck. North Carolina's Sir Walter Wally. And of course the most well known: Punxsutawney Phil. Silly, Silly. But Canada is not without shame. We have our share of weird wolly woodchucks: Balzac Billy from Alberta. Shubenacadie Sam of Nova Scotia. And, of course, our answer to Phil, Wiarton Willy, just outside our nation's capital, Ottawa. Given their woeful record of prognostication, being held up to riducule and their alliterated assinine monikers, my money's on another Phil - Phil Connors. Now, that man was accurate! My money's on Phil Connors too...ooh, that reminds me of our annual tradition, watching the movie on Groundhog Day! You know, every year is getting to be the same, including this movie I watch on Candlemas. Is that a mass of candles or what? My favorite groundhogs are Punxsutawney Phil, and adorable " Smith Lake Jake". And I like the white groundhog too. I have to say that my favorite groundhog is Alabama's "Smith Lake Jake". He smiles and he wears a hat. I SAW HIM ON A CAR COMMERCIAL.